There’s been plenty of gloom cast over Kickstarter recently, so let’s focus on the good things: like how crowdfunding ended Brian Fargo’s 20 year run of Wasteland 2 rejection. You have to admire a man who spends two decades trying to make a game happen without giving up. And it’s been worth the wait according to Yannick, who’s been impressed with his time in the game so far. “I always knew there was an interest,” Fargo explained to me. “I used to travel all over the world and people would always ask me about it. I never knew there was any doubt that there was interest in it. It was frustrating to have this audience of gamers that were dying to play it and I was dying to make it, I just couldn’t bring the two together”. But having an interest and being able to make it happen are two different things. The first hurdle being the rights which EA had clung onto after the first game in 1988. “It’s pretty common knowledge that’s where Fallout was born because I couldn’t do Wasteland 2”, says Fargo. In 2002 Fargo founded inXile and got the rights to Wasteland back from EA. There was one problem though: no one wanted it. Or at least no one wanted to pay for it. “I spent a decade pitching it”, says Fargo. “I thought publishers would be jumping all over me to do this thing and the answer was no, they weren’t.” He attributes the indifference to the politics of modern publishing. “That’s the funny thing about when you’re dealing with a green light committee at any kind of publisher, you’re not dealing with the audience, you’re dealing with someone’s interpretation of what the audience might like and they become the gatekeeper of good taste and what might sell”. The reasons Fargo and Wasteland were turned away were varied with responses that included, ‘we already have one of those’, or ‘we don’t want to do existing games, we want to do new stuff’. “Every answer was different”. Even Bethesda’s big revival of Wasteland’s spiritual sequel didn’t change anything. “I thought with the success of Fallout 3, this is it! We have the father of Fallout, surely this will persuade them but no”. 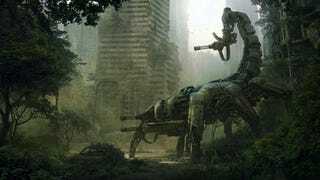 Which leaves Kickstarter; the only reason Wasteland 2 happened. “If not for crowdfunding this game would have never gotten made”, confirms Fargo. “It just was never going to happen”. While there have been potato salads and apparent ‘take the money and run’ projects, crowfunding is still a positive environment that’s encouraging the survival of games that would otherwise be rejected by more traditional publishing models. “It’s certainly making it so that they can exist which they couldn’t have otherwise,” agrees Fargo. “We’re certainly a good case in point”. And it’s not just the games it’s helping survive, it’s a certain kind of studio. “It’s had a major impact on our business”. The current business climate as Fargo sees it consists of “less than 20 triple-A developers” worldwide and then “hundreds of thousands of smaller groups that are half a dozen people”. InXile fits in neither. “We’re in that special place of 20-30 people teams that you need to make a game of this scale, we’re the middle ground and the mid-tier developer was disappearing so absolutely [crowdfunding] has given us a new lease of life”.